You are here:Home-Domain.com-How Much Does a Domain Name Cost? In today’s world, it’s rare that a company exists without a website. The internet is now the biggest railway that connects customers and businesses locally, domestically, and internationally. It’s common knowledge that a company’s presence and visibility on the internet can dramatically affect its chances of success. In which case, if you’re currently creating an internet presence for your company, building a website, or preparing for both, then you may want to know if the website domain name you’re after is available. You may also want to know how to register it, and most importantly how much it’s going to cost you. If that’s where you’re at, then look no further. We’re going to cover all of the above. A domain—or domain name—is essentially the name of your website. It’s not always exclusive to the actual business name and even less so with the LLC or legal title. It exists on the Domain Name System (DNS) which is a universal system that assigns addresses to servers and web pages. It’s the middle of the URL (the name), what comes after the ‘www.’ and what you will see after the @ in an email address. Without domain names, recognizing addresses on the internet would be extremely difficult. Some experts go as far as to say that without the DNS, the internet would’ve never succeeded. When registering a domain name, it is paramount you understand the way in which they are formatted. Without this understanding, it is possible that someone unknowingly registers the wrong type of domain. Unlike the English language, domain names read from right to left. SLDs appear in the middle of the domain, directly on the left of the TLD. They are, in fact, the domain name itself. At the furthest left, we have the machine name, which is what we call the end of the domain. You will typically associate the machine name with (www.). The SLD, TLD, and Machine Name are all separated by a period. Most of us on the internet have adopted the word ‘dot’ in substitution for ‘period,’ but they are one and the same. Lastly, it is vital that we differentiate a domain from a URL. They are not mutually exclusive. A URL is a larger address that can contain the page address, folder, machine title, and protocol. This, in turn, makes the domain name merely a part of the URL. We have provided a few examples below and bolded the domain names for reference. Without a doubt. Think of registering a domain name like buying real estate on the internet. You are purchasing a piece of the pie that is exclusively yours, one that will hold an umbrella over all of the content you publish. If you register your domain, no one else can take it. It is placed in the DNS where it belongs solely to the person who purchased it until it expires and becomes public again. It is your first impression on the internet, your brand, and a tool that can be used for SEO (search engine optimization) purposes. Any web developer will tell you that a domain name is a facet of a company’s internet presence that can directly influence its success. Now that we have covered some basic grounds on domain names, let’s dive into registering a domain. It is important that you know, despite what type of domain you are looking for, the process is relatively simple. While there might be quite a few options available, the process is straightforward. As we stated previously, once you register your domain it becomes part of the DNS, meaning it is not available to anyone else. Likewise, if someone has previously registered the creative domain name you want, it is not going to be available to you. Ensuring that your sought-after domain name is available is the first part of the process. Other than just the website name, there is the TLD (the first or far right part of your domain name). The common ones are usually taken. Think .com, .org, .net, and so forth. Still, it’s not always the case. If appropriate to your circumstance, you may find a variation of your domain name with another TLD that is still available. Additionally, the ‘common’ TLDs are not the only thing offered. Today, there are GTLDs (generic top-level domains) that end in different terms. This could be .pro, .info, etc., and even new domain extensions your business can leverage to render your domain name instantly memorable to customers. Which TLD should I use? This, of course, depends on the type of business you are putting on the internet. If you’re wondering about the full process of how to register a domain name, it’s important to note that every domain must go through ICANN (Internet Corporation for Assigned Names and Numbers). All domain names run through this corporation, as it was established to regulate them and optimize the internet’s efficiency. A domain name registrar is a company that provides a service, simplifying the registration process for domain names. Through these platforms—all of which have accreditation through ICANN—experienced professionals will act as your Sherpa, guiding you through the terrain of domain registration. From front to back, the process should be seamless. Be sure to research a registrar before utilizing their service. While many promise to be the easiest, cheapest, and most efficient option, customer reviews can tell a different story. This is the company that is going to be responsible for keeping track of your renewals, managing your domain, and ensuring that it is registered correctly. Be sure to do your due diligence. The cost of your domain name will depend on the registrar you choose. Each registrar has its own standard pricing, packages, renewal fees, and accessorial fees. Being that TLDs are the most common, they are going to have the most standardized pricing across the board. On average, it costs around $10-15 annually to purchase and hold a domain name. 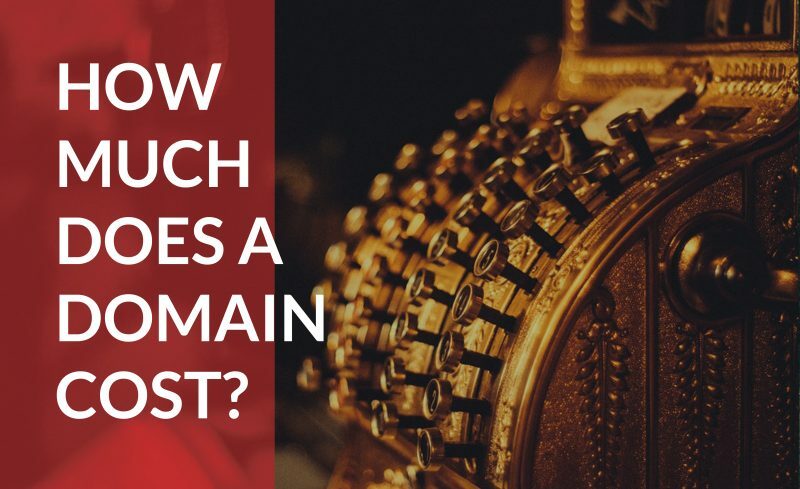 Regardless, there is a lot more to know when it comes to how much a domain name costs. By analyzing the myriad of complaints filed against registrars, you will find that a vast majority of them regard fees the customer was unaware of. These typically come in the form of an auto-renew or transfer out charge. Usually, these are explained and detailed in a registrar’s ‘Terms of Service.’ Unfortunately, in today’s world, we rarely take the time to read the contracts we willingly agree to. These fees that accrue can be up to four times the amount of the original registration. Typically, the heftiest fee is the transfer out charge, as registrars want to dissuade their customers from running to their competition. With a quick Google search, you will find a large volume of complaints that pinpoint this tactic that registrars use to squeeze money out of clients that are jumping ship. In any case, we always advise you read and acknowledge the ‘Terms of Service’ issued by your registrar. While there may be fees in the contract you do not particularly agree with, you will be prepared for them if they are to arise in the future. Another unethical tactic deployed by untrustworthy registrars is discounted pricing scams. By no means are we saying that every registrar who offers discounted pricing is running a scam, but we want to highlight that some platforms offer discounts if the domain is purchased for a longer period of time, and they do so with malintent. For example, let’s say you have paid them for a five-year contract, some registrars will then turn around and pay the registry for only a year, pocketing the rest of the money. They can even go as far as to implement a ‘no refund policy’ that, if the customer doesn’t catch in the agreement, will render their money lost if they want to leave. It is important to note that there are platforms which have been created to help customers identify if their expiration date matches what they paid for. Many of these are free. But Exactly How Much Do They Cost? The answer is yes, it is possible, but it’s not always the case. A good rule of thumb when it comes to buying domain names is that inexpensive can be expensive. Sometimes a cheaper deal is too good to be true and the hidden fees blindside the customer. On the other hand, if your domain is available and you choose a reputable registrar, that cheap, inexpensive, and seemingly perfect package is absolutely worth it. Thus, we encourage you to do your due diligence and research the experiences certain customers have had with different packages offered by registrars. Take these packages and further execute a domain name price comparison between other registrars. Lastly, remember that the type of domain name registered is always going to influence the price. Take Domain.com’s pricing for example. It ranges from as little as $1.99 per year all the way through $649.99 per year depending on which domain you select. Each registrar will differ in their pricing, but the more you compare, the more consistencies you are going to discover. When a domain name is unavailable, most customers pivot and return to the drawing board to decide on another. Some, however, find that there is great value in the specific name and wonder how they can obtain an aftermarket domain or a domain which has already been purchased. Today, both auction sites and domain brokers exist, meaning the person no longer has to track down a specific domain owner to make an offer. Aftermarket domains have become an industry in themselves, prompting internet entrepreneurs to purchase domains with the idea that they will be sought after in the future. They hold onto these domains until someone comes along to try and claim them. Branding, inbound links, potential traffic, and pure simplicity is what adds to the value of these domains. Some are valuable enough that they sell for around $100 and others are purchased for over $10million. With that being said, if you’re currently in this boat, then the average .com aftermarket domain should be somewhere between $9000 – $30,000. In which case, before continuing, unless what your after is extremely obscure, you are probably going to have to pay in the thousands for the specific domain name that you want. Is it without a doubt that domain names are important to your business’s success on the internet (and in general). In today’s digital landscape, unless you are looking for an aftermarket domain and have zero flexibility in your name choice, then there is no reason the cost of your domain should drain your wallet. For a select few customers, the price is going to be high. For most of us, we should not expect to pay more than $20 annually. With that being said, remember to look for hidden fees, discount scams, and ensure that there is no sneaky language in the terms of the agreement.